The Zetas drugs gang has been described as "the most formidable death squad" in Mexico. It is believed to have come into existence some seven years ago, when leaders of the Gulf cartel of illegal drugs traffickers took it on as their security network. The gang was called Los Zetas after the Mexican word for the letter 'z', as this was the radio call sign of one of their first leaders, former Mexican Special Forces Lieutenant Arturo Guzman Decena. According to reports, Mr Guzman took 30 other personnel from Mexico's Special Forces Airmobile Group to work with him for the Gulf cartel. In addition to providing security, the gang collected debts, secured cocaine supply routes, and murdered rival gang members. The original group trained new members, and quickly became known for its ruthlessness, in particular for beheading their victims. The Mexican Defence Ministry has described the cartel as "the most formidable death squad to have worked for organised crime in Mexican history". By 2007, after the extradition of Gulf cartel leader Osiel Cardenas-Guillen to the US, the Zetas are said to have begun running their own drugs smuggling operation from Mexico to the US. According to the US Drug Enforcement Administration (DEA), in 2009 the leader of the Zetas was Heriberto Lazcano-Lazcano. It says he was a corporal in the Airmobile Group before being recruited by the Zetas in 2002, and it has offered a $5m (£3.2m) reward for his capture. Ten members of the Zetas are on the DEA's most-wanted list, with total rewards offered amounting to $50m. The Zetas have apparently switched their operations from the west coast state of Michoacan to Tamaulipas on the east coast, and down to Cancun in the Yucutan Peninsula. As the Zetas have tried to take over territory controlled by other gangs, there has been a sharp increase in murders of rival gang members. In February and March 2010, between 200 and 250 members of rival cartels were killed as they battled to control regions in Mexico's north-east. Together with Mexico's other drug cartels, the Zetas smuggle Colombian-produced cocaine over the border into the US, as well as marijuana grown in Mexico, and other chemical drugs produced in clandestine laboratories dotted around Mexico's arid, sparsely populated north. In addition to drugs, the Zetas have specialised in human trafficking, making huge profits from smuggling migrants from Central and South America across Mexico's border with the US. The Zetas are said to charge $1,000-$2,000 for each man and woman smuggled across the border. The business also gives them contacts throughout Central America, and in the US, where they are suspected of committing a number of murders. In late August 2010, they are thought to have been responsible for the deaths of 72 Central and Southern American illegal migrants, whose bodies were found outside the town of San Fernando in Tamaulipas. They have also become notorious in Mexico for breaking out of jail when they are caught and imprisoned. In May 2009, 53 inmates of Cieneguillas prison in Zacatecas state escaped, freed by gunmen thought to be Zeta members. Some analysts say that Mexican government's hardline tactics, such as the recent raid which ended with the deaths of 27 alleged Zetas near the US border in Tamaulipas, have seriously weakened its capacity. Other observers in Mexico are more sceptical. They point to what happened in July 2010 in the northern city of Monterrey, when Zetas leader Hector Raul Luna Luna was captured by the authorities. Following his arrest, gangs of hooded youths blocked off the city of over one million inhabitants for five hours, bringing all transport to a standstill and holding many people hostage. Local newspapers pointed to the fact that in Monterrey alone there are as many as 30,000 youngsters aged between 18 and 24 who have no work apart from the easy money offered by groups such as the Zetas. 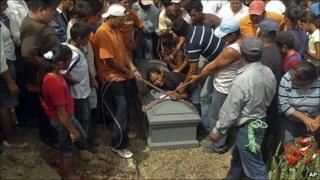 Some 28,000 deaths have been blamed on organised crime since President Felipe Calderon came to power in 2006. He has drafted as many as 50,000 members of the security forces into the fight against the cartels, but is facing increasing criticism because of the surge in deadly violence throughout Mexico.